A permanent liquid color available in 65 shades, ideal for quick application and coloring in between foils. Use for deep conditioning gray coverage, with 84% more conditioning than the leading professional cream. 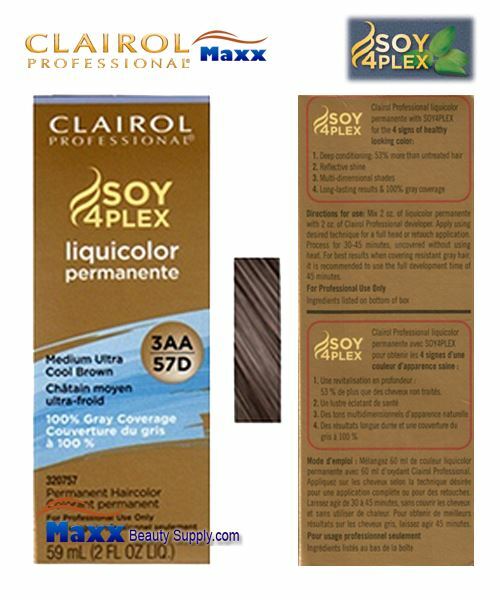 Clairol Professional liquicolor permanente features our unique SOY4PLEXTM technology for the 4 signs of healthy looking color: Deep conditioning, reflective shine, long-lasting color, and multi-dimensional results. For excellent gray coverage on resistant gray hair use the Gray Busters NN Series, available in 6 rich shades. Use with Clairol Professional Pure White or Clairoxide developers for best results.